This is the section of the site which will be updated every week. 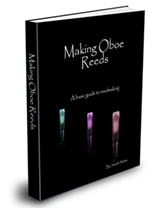 Remember that by subscribing to the Making Oboe Reeds Newsletter, you will have access to even more free info on oboe reed making. So let’s start off by looking at some oboe reed photos. You can’t tell that much by looking at a photo of a reed, however it might be interesting to see. The “crow” of the reed is where most of the information is, so learn how to crow the reed properly. This will help you learn to balance the reed. Some of the oboe reed tips which I am prparing are articles on tying the blank, and basic methods of using the knife to scrape the reed. Balancing the reed. . . Here are some helpful hints.